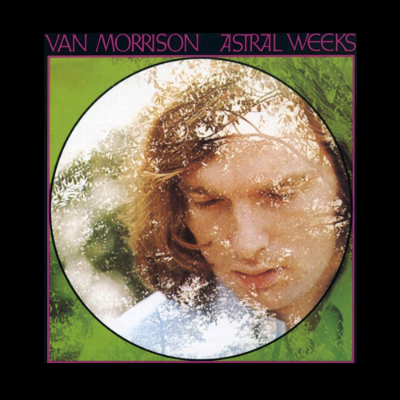 I don't remember how I first heard Astral Weeks, but I love it because it's a rambling stream of consciousness. And there are such great lines in it: 'Gone for cigarettes and matches in the shops', or, 'And I will walk and talk. In gardens all wet with rain', or, 'If I ventured into the slipstream/ Between the viaducts of your dream...'. It's boyish and dreamy and poetic and imaginative. What's beautiful is all that industrial imagery. It's probably to do with where he was at the time, which was probably Northern Ireland. I took a lot of inspiration from the conversational style, 'I did this and then I did this', that rambling style. I love Van Morrison as a storyteller. It's nice cos all the songs seem like part of the same story, it's one big long play. It's an experience: you're walking into someone's world for 40 minutes or whatever it is. There are only eight songs, but some of them are nine minutes long. I love the decadence of how long they are. And the synergy between the musicians is amazing. Danny Thompson's on bass, and I love that the bass is stupidly loud. I once was about to record an album with someone, and it was all set up and ready to go, and I heard that they don't like Astral Weeks and I said, 'I'm sorry, I can't do it any more'. He called up and said, 'Really? Because I don't like Astral Weeks?' and I said, 'Yeah.' It was a dealbreaker, for me. This album is Van Morrison at his very best, his most spirited and fired and channelling. Because I think Van Morrison is one of those artists where the reason that he's grumpy is because he knows he's at the mercy of grace. By which I mean that he knows that he's channelling, and it comes from somewhere else, and it can make you really grumpy because you don't know where it comes from. He says it here in an interview: 'Astral Weeks songs... were from another sort of place... They are poetry and mythical musings channelled from my imagination... The songs were somewhat channelled works... As my songwriting has gone on, I tend to do the same channelling.' See, that's why he's a grumpy fucker. 'Cause he can't do it. He's at the mercy of grace. And that can make you really quite tetchy. I've been to a Van Morrison gig that's amazing, and I've been to a Van Morrison gig where I'm bored and nothing's happening. He's one of those people where either god shows up, or he doesn't. But I'd love to meet him and work with him. Because, I know it sounds really bad, but I understand that grumpiness.